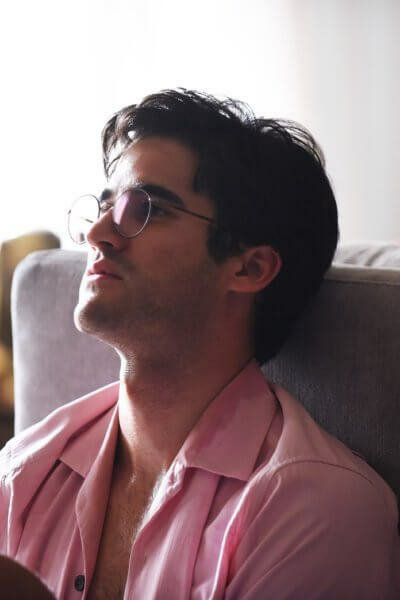 The season finale of FX’s The Assassination of Gianni Versace: American Crime Story begins on July 15, 1997 in Miami Beach, Florida. 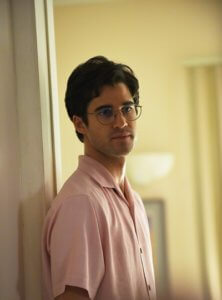 Andrew Cunanan (Darren Criss) walks down the sidewalk past dozens of people, including two police officers. They don’t realize they’ve just walked past the man who is about to murder fashion icon Gianni Versace (Edgar Ramirez). After Andrew pulls the trigger, he stands over Gianni’s prone body. Later that night, Andrew breaks into a houseboat. He goes through the medicine cabinet and then the refrigerator where he finds an unopened bottle of champagne. Smiling, he opens it as a new report comes on TV announcing Gianni Versace’s murder. They show footage from outside Versace’s mansion and the news segment includes an interview with someone who saw Versace’s body. Andrew sits up and pays attention when his photo’s flashed on screen and it’s revealed he’s the suspect. The murder’s described in detail along with the route Andrew took to escape. He ventures outside the house and sees helicopters in the sky and hears sirens in the area. Cradling the champagne, he relaxes in a lounge chair and takes it all in. The FBI informs her Andrew evaded capture once again. They suggest she leave Florida, for her own safety. “You want me to run? You want me to hide from him?” she asks. She isn’t going to leave and refuses to miss a broadcast now. Marilyn shows up to work, ready to break some more sales records on The Home Shopping Network with her perfume. Andrew wakes up and Gianni Versace’s death is still all over the news. Andrew’s described as a male prostitute who’s extremely dangerous and wanted for four murders. He’s on the FBI’s Most Wanted list. Andrew goes through the closet and picks out a button-down shirt. He heads into town, reads the newspaper and watches a woman slip her car keys into her purse. Andrew follows her down the street, grabbing her purse when she sits down at a restaurant. Andrew steals her car but is soon stopped in line at a traffic checkpoint where police are going through each car. He pulls away and enters a neighborhood where he asks a stranger if there’s less traffic on any particular streets heading off the island. The man informs him the police have set up checkpoints on every street so they’re all crowded right now. Andrew eventually parks the car and tosses the keys in the ocean. He screams as he throws the keys, realizing he can’t get off the island. Andrew walks the streets and notices an FBI Wanted Poster. Someone has drawn on it and made Andrew look like a woman. He returns to the houseboat and continues to listen to news reports. A reporter is outside his mother’s home in National City and she reveals the FBI is questioning her about her son’s whereabouts. Andrew watches as his mother’s surrounded by reporters and FBI agents and then taken away. Elsewhere, the police return to question Ronnie (Max Greenfield) about Andrew. He claims he only now realizes the man who introduced himself as “Kurt” was actually Andrew Cunanan. He also says he was just about to call the cops, and then adds that they weren’t friends. At the police station, Ronnie says Andrew wasn’t hiding when they were together. Andrew was partying. He then realizes these two cops are the only ones who were actually searching the area for Andrew before he murdered Gianni Versace. Ronnie reveals Andrew never stopped talking about Gianni Versace, and he believes Andrew wanted everyone to know about his pain and about being born a lie. “Andrew is not hiding; he’s trying to be seen,” explains Ronnie. Meanwhile, Andrew – in broad daylight – breaks into a boat that’s completely covered. He scrounges for food and then looks through maps. When someone calls out “Guillermo,” he hides in the cabin, gun pointed toward the front of the boat. A woman walks around the boat, approaches the door where he’s hiding and then hurries off the boat when she realizes someone is holding the door shut. After the woman runs away, Andrew sprints from the boat and returns to the houseboat he broke into the previous evening. It’s within view of the boat and he watches as the police arrive to check out the boat he just fled from. He hears his friend Elizabeth on TV and pauses to watch her read a statement. She believes he’s a good person and not violent, and that he can still show the world the side of him she knows. She asks him to end this manhunt peacefully. A special report comes on and it traces Andrew’s murderous path. The reporter reminds the audience Jeff Trail was murdered in David Madson’s apartment, and then David went on the run with Andrew. The special report will explore David and Andrew’s road trip following Jeff’s murder. David’s father is interviewed and he says his son was innocent. He hates the fact there’s a cloud of suspicion hanging over David. He wants Andrew to confess and clear his son. Andrew turns off the TV and then goes through the house turning off other televisions. He pauses long enough to hear David’s dad say his son must have thought he could stop Andrew and that’s why he went with him. That evening, Andrew sits on the street and listens to the noise from the city. Back in the houseboat, he rifles through the garbage looking for any food he missed. There’s nothing there so he resorts to eating canned dog food, which he finds disgusting. Andrew watches Marilyn Miglin on TV promoting her Miglin Magic Perfume Set on The Home Shopping Network. He listens as Marilyn discusses her father who passed away when she was young. Andrew seems to be soaking up the emotional story of Marilyn’s upbringing with a mother who struggled to make ends meet. Andrew uses a payphone and calls his father in Manila. Apparently, his dad’s been taking money for interviews, and when he speaks to Andrew he assures him he’ll fly right to him. He learns his son is in Miami and gets the address of the houseboat where he’s hiding out. His dad swears he’ll be there in 24 hours and will hold him in his arms like old times. He warns Andrew to stay out of sight and be ready to leave as soon as he arrives. Andrew packs up stolen items along with his books and passport. He relaxes under the stars and smiles. The next morning, he sits by the front door with his packed bag and waits. The day goes by and his dad doesn’t show up. Frustrated, he steps outside and looks around before slowly returning to the house. When he does, he sees his father on TV doing an interview. His father claims Andrew isn’t gay and is a special man. He says Andrew calls him regularly, including since the murders took place. He won’t give up Andrew’s location but thinks Andrew is a genius who will never be caught. He lies and says they often talk about the movie rights to Andrew’s life story. Andrew’s dad is acting as the broker and making calls to Hollywood. He even says the film has a title: A Name to be Remembered By. He claims Andrew insists on that exact title. Andrew stares, in shock, at his dad on TV. The interview continues and Andrew’s dad says they’re in early talks with several studios. He also goes on to confirm he can’t travel because of his own legal troubles. Andrew has heard enough and shoots the television set. The story switches to July 22, 1997 in Milan, Italy. It’s the day of Gianni Versace’s funeral and Donatella (Penelope Cruz) believes Gianni should be alive, if people did their jobs. Antonio D’Amico (Ricky Martin) is with her and confesses he knew Gianni was dead when he heard the gunshot. He also reveals he just wants to stay close to Gianni, and Gianni made it so he can stay in one of the houses. Donatella informs him Gianni doesn’t own the properties; the company owns each of the properties. The Versace board controls everything. She suggests he go to their home in Lake Como and take some time to recover. However, eventually he’ll have to move out and start a new life. “I can not be thrown away like a piece of trash. I loved him, Donatella,” pleads Antonio. Donatella is sorry for his loss, but will not help him. Andrew continues to eat dog food while watching news reports. He also watches Gianni’s funeral which is televised live. Antonio’s name is not mentioned during the funeral and he’s snubbed by the priest. Andrew cuts his hair close to his scalp to alter his appearance. A caretaker checks on the houseboat and quickly realizes something’s wrong. He enters the houseboat, gun drawn. He calls out, asking who’s there and Andrew fires into the ceiling. The man runs away and the police, including a SWAT team, are called to the scene. The houseboat‘s surrounded, and Andrew’s trapped inside. Andrew watches news reports showing the house he’s in. The houseboat is rocked as helicopters fly overhead. The police use loud speakers to announce they want to talk. Andrew won’t talk and snipers are in position in case he makes another run for it. He has a vision of himself as a child sitting on the edge of the bed. He watches a recap of his life, including his time at Bishop’s High School. The police cut the power and send in smoke grenades. SWAT team members enter the home carefully as Andrew sits on the bed. He puts his gun in his mouth and giving himself a last look in the mirror, pulls the trigger. The next scene features Andrew talking to Gianni Versace on stage at the opera, discussing his future. Gianni advises him to finish his novel and Andrew asks if he could possibly be a designer – maybe he could be Gianni’s protégé. Andrew attempts to kiss Gianni, but Gianni won’t let him. He tells Andrew he’s an interesting young man, but he simply doesn’t have time for a relationship. The cops look at Andrew’s dead body. It’s then removed from the houseboat with photographers snapping photos like crazy. The FBI arrive to tell Marilyn Miglin that Andrew shot himself. She’s thankful it’s over. In her dressing room, she reveals she received letters about her husband’s good work. He gave money to people, helped out those in need, and was a terrific human being, according to these letters from strangers. She had no idea he did all this, including paying people’s bills. He didn’t discuss this with her and she wonders why. She’s been replying to each letter and thanking them for their kind words. She’s very proud of her late husband. Lake Como, Italy: Before meeting with their lawyers, Donatello confesses to Santo Versace that Gianni called her the morning before his murder. He wanted to know every detail about a show she was overseeing. She was annoyed and didn’t need his help. He called again 30 minutes later and she ignored the call. Donatella begins crying, upset she didn’t pick up the phone for what would have been their final conversation. Antonio pours out dozens of pills. He stuffs them in his mouth and washes them down with alcohol. Donatella visits the family’s mausoleum and lights candles. Antonio is found near death by the maid.